A Kotobukiya Japanese import. Up next in the Ani Statue lineup from the popular Ore no Imouto ga Konna ni Kawaii Wake ga Nai (‘My Little Sister Can’t Be This Cute’) franchise is a new version of the part-time model and Kirino’s best friend Ayase Aragaki -Cosplayed As Thanatos. Trading in her traditional school outfit, the pretty girl appears here in an incredible costume, stunning (and perhaps slightly embarrassed) in a sleek, highly revealing jumpsuit. 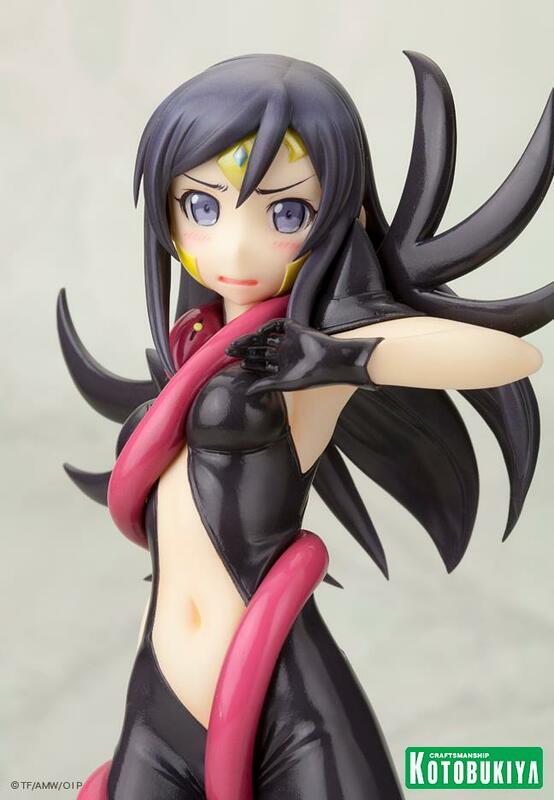 With cuts and strategically placed missing sections, Ayase’s suit is a shiny black while the long snake that winds around her body is a bright pink. The female cosplayer strikes a fun pose with a wide stance, feet pointing inward, and her left hand raised as if to ward off onlookers. Meanwhile, Ayase’s pretty face features a great expression and heavy blush making her all the more adorable. There are even great details in the costume’s headpiece around her face and its spiky collar. Sculpted by Ryu, Ayase Aragaki as Thanatos stands 8 inches tall (1/8 scale) and looks great displayed on her own or with previously released Ani Statues from the Ore no Imouto series.